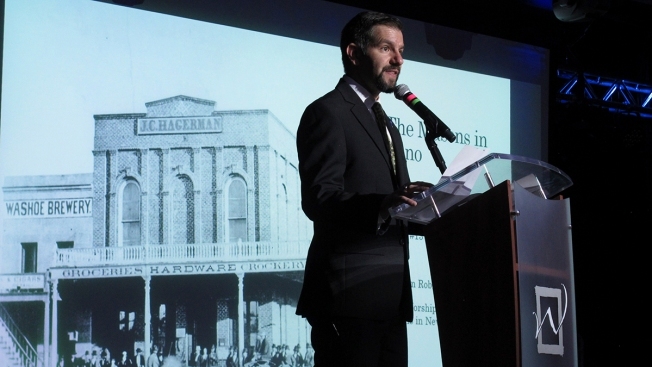 The Reno Masonic Lodge built in 1872 is shown on a screen behind Nathan Digangi, worshipful master of Reno Lodge #13, as he speaks Tuesday, April 16, 2019, in Reno, Nev., at the unveiling of a time capsule found inside the recently demolished building. Artifacts inside included silver dollars minted in Carson City and San Francisco and a piece of wood from Sutter's Mill where the discovery of gold in 1848 sparked the California Gold Rush. Artifacts recovered from an 1872 time capsule stashed in the cornerstone of a demolished Masonic lodge in Reno, Nevada include silver dollars minted in Carson City and San Francisco, and a piece of wood from Sutter's Mill where the discovery of gold sparked the California Gold Rush. Reno Mayor Hillary Schieve, leaders of the Freemasons and local experts unveiled materials Tuesday pulled from a lead box inside the cornerstone of what was until recently the oldest standing commercial building in the city founded four years after Nevada was granted statehood in 1864. Other items include a quartz specimen from the drill at Sutter's Mill in Coloma, California, a harmonica, a business card from the Young Men's Christian Association offering "Spirited Refreshments" for 25 cents and an edition of the Virginia Enterprise in nearby Virginia City where Samuel Clemens began his newspaper career during the 1860s before adopting his pen name, Mark Twain. The Reno Masonic Lodge was built along the railroad tracks when Ulysses S. Grant was president shortly after the Comstock Lode of gold and silver was struck in Virginia City. The cornerstone was laid on Oct. 15, 1872, a block west of where now sits the famous arch over the main casino drag proclaiming Reno "The Biggest Little City in the World." A year later, Jacob Davis, a Reno tailor with a shop a block away, patented the first pair of copper-riveted jeans with Levi Straus & Co.
"These materials have been sealed in this time capsule for 147 years," said Catherine Magee, the director of the Nevada Historical Society and art conservator who lead the excavation of the time capsule. "Reno was a tough little commercial town," she said. "This lot was on the bustling corner of Commercial Row across from the railroad platform." The lodge's bottom floor housed a dry goods and grocery store for decades. The developer of the neighboring Whitney Peak Hotel unearthed the cornerstone in February while deconstructing the building and salvaging original wood and bricks in preparation for future expansion. Some papers in the box were waterlogged, but once restored Magee said they'll be able to read pages from the Nevada State Journal, Reno Crescent, Carson Appeal, Sacramento Union, San Francisco Chronicle and Examiner. In addition to the 1872 silver dollars, the capsule included a Mexican dollar, an English quarter shilling and two American 3-cent pieces. There's a silver specimen from a mine in White Pine County near the Utah line, the Constitution of the Masonic Grand Lodge and the names of all the officers of the state of Nevada and Washoe County, as well as members of the California Legislature, 1871-72. "Materials in a time capsule are meant to give the discoverers a window through time into what was happening at the time of the encapsulation as well as what was deemed important by the people who were placing them in the time capsule," Magee said. "It means much more than one piece, one item taken out of context," she said. "For example, the Mexican dollar would simply be an old coin. The fact these coins were chosen to be included tells something about the cultural ties the Masons thought were important." Masons are part of a fraternal organization that traces its roots to stonemason guilds in the Middle Ages. Stephen Robison, grand master of the Masons in Nevada, said they've been laying U.S. cornerstones for 300 years. Now mostly symbolic, they once were the "critical first stone" of a building that had to be set level to ensure square, parallel and perpendicular walls, he said. The cornerstone for the U.S. Capitol was laid in 1793 by one of the most famous Freemasons, President George Washington, he said.